This past Sunday, at the Wellington Harbourside Market, I paid a visit to the floating fish shop. As I watched the customers calling out their orders for snapper, flounder, salmon and tuna, cleaned and filleted to order by the boat’s crew, I couldn’t help but wonder – how can I eat fish responsibly? We all (should) know by now that most commercial fishing practices are pretty terrible, environmentally speaking. The oceans are in serious trouble, and will eventually be devoid of fish if we keep stuffing our faces with seafood at every possible opportunity. Farmed fish… especially salmon, are also problematic, as they can affect wild populations health and safety. So, how to be a sustainable fish-eater? I don’t know. Greenpeace maintains a list of the most vulnerable fish species in New Zealand, those that should be avoided at all costs. I witnessed many of them being snapped up by eager shoppers on Sunday. But what about fish not on this list? In New Zealand, Tarakihi are one of your best bets. I’m not sure why, but a reliable information source told me that. I guess it would be good to know why, but I can’t be bothered to try and do that research right now. I have a stack of books and articles to wade though. So, on Sunday, I asked the fish man for 2 Tarakihis, cleaned, but not filleted, which I plan to make Laap Pa with tomorrow evening. That’s Laotian Fish Laap for those of you who don’t speak Lao! Mrs. Sypha taught me how to make Nem Pa.
It’s basically this really delicious mixture of fish and herbs and rice that you make into spring rolls. Here are the pictures – full recipe deptails will follow. 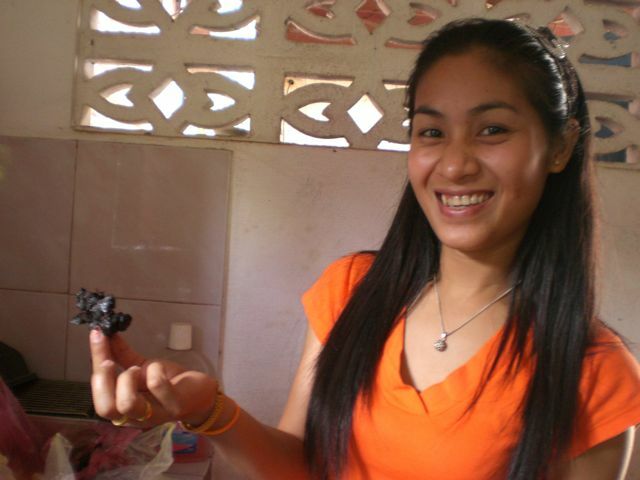 This Sunday I went over to a friend of mine named Mee’s house for cooking lessons. We made Tom Yum and Pad Kha Pao Pa – delicious. 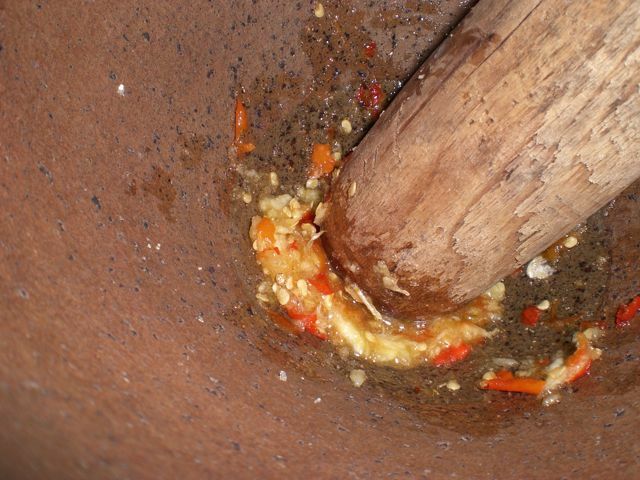 and crush together in a mortar and pestle (or food processor). don't forget the fish sauce! 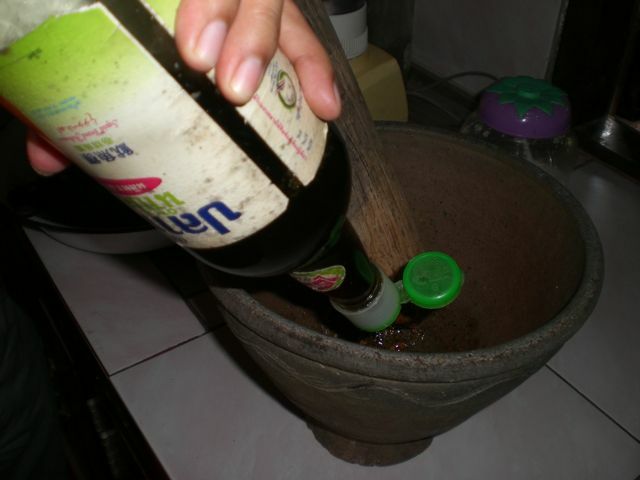 Add the juice of 1 lime, and 3 tbs of fish sauce. Use this to pour over the fish when done. i prefer not to eat the fish heads. Heat about 1/2 cup of oil in a wok. Once the oil is hot, add the fish and fry until golden brown, flipping once. 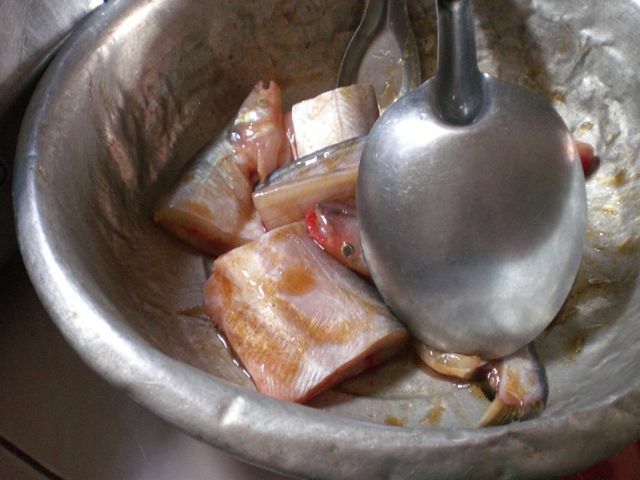 Remove the fish from the oil. Throw in some fresh herbs and deep fry for a minute. The herb Mee used was something between sweet basil and cilantro – I don’t think it exists outside of Asia. But try whatever you can get your hands on – it will be delicious, I am sure. 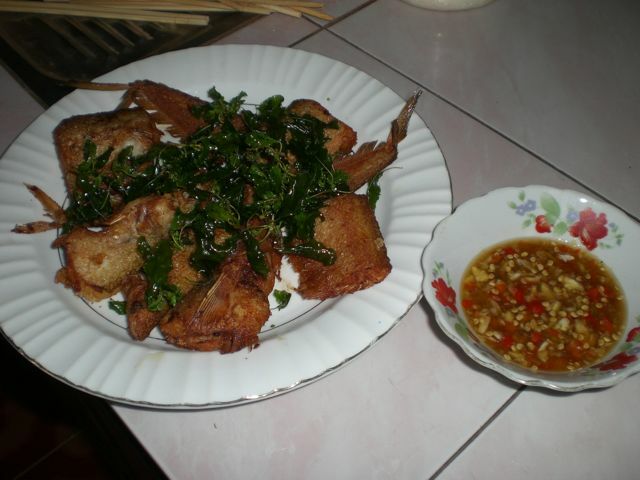 If you’re interested in other Lao or Thai recipes, drop me a line, and I might already know how to make it. If not, I can ask for another cooking class! At some point in the future I planto post recipes for Tofu (or fish) Laap, and maybe sticky rice ball salad.